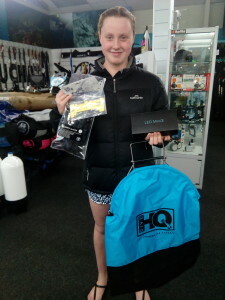 Young Maddie qualified last month and was last months winner of the Hollis Midi Torch/Kevlar gloves/DHQ Catchbag and cray measure package, Maddie’s response to winning was, “This is awesome, this is my first part of my very own dive gear. Thanks”. Enjoy your new gear Madeline! from the Dive HQ team.